I never reviewed the first movie, though rest assured, I did watch it. It was honestly so baffling and not enjoyable that I didn't even bother writing about it. While I thoroughly enjoy skewering a bad movie, sometimes I can't even bring myself to do it because that means I have to spend time thinking about the movie to even write about it (see: John Carter). 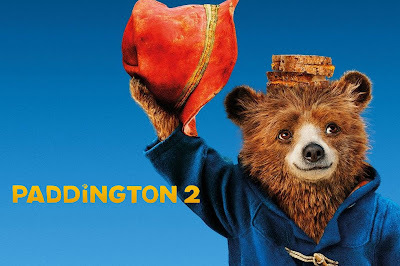 So when the reviews for Paddington 2 came out, I was even more confused. People loved it? So much so that they were willing to rave about it? And Hugh Grant in particular? I was damn near convinced there was some kind of hypnosis happening at theaters across the globe, putting critics and audiences in some kind of trance. But I have kids, so I knew I'd watch it eventually. Because no matter how terrible it seemed, it had to be better than sitting through one of those insipid Tinkerbell movies. I liked it. I can't believe it, but I liked it. It's still stupid and ridiculous and definitely baffling (especially the part about a simple b&e carrying a 10 year prison sentence), but somehow much more enjoyable this time around. It's simple in its joy of Paddington's goodness and hard lines it draws about selfishness and and unkindness. In terms of a kid's movie, it's uncomplicated and sweet. No snarky jokes made for the adults, no mouthy friends that say things you wish your kids wouldn't repeat--nothing but an animated bear and a clear villain. Speaking of the villain...it is almost uncomfortable to recognize how good Hugh Grant is in this movie. I think we take him for granted as an actor because he is so good at playing a particular role that when we do notice his brilliance, it's almost awkward. The first time I noticed was in Florence Foster Jenkins. The second time was here. Maybe the less I expect of a movie, the more I appreciate him. At the end of the day, I understand why audiences were so charmed with this movie. I love a dark or funny or exciting children's movie, but sometimes we need a break to indulge in some good old-fashioned clean entertainment too. Final word: Finally, a sequel better than the original!